EFFECTIVE ALL NATURAL - NO ADDITIVES - NO PHARMACEUTICAL CHEMICALS WHATSOEVER. Over the past fifteen years we have been researching effective combinations of our colloidal silver, gold, copper and zinc, to assess how to use one or more to act as a trigger to accelerate the effects of another, and thus use one as a carrier to magnify the effect of the other/s so as to gain the most effective results on a given condition. For use both orally and topically. Over 25 proprietary Specific Formulas created from 100% Organic Ultrafine Colloidals offering specific treatments for a whole range of conditions. They can eradicates germs, viruses, bacteria, allergens and pathogens. Boost body's immune system, accelerates healing and repair process. This ultrafine quality is safe for use directly into eyes (silver/gold only), ears and nose for immediate relief of sinus, eye infections and ear problems. These colloidals will BOOST your OWN immune system and deal effectively with disease and illness. Please remember these therapies are not just another pain blocker but will deal with the root cause of your physical ailments, and with a little patience eradicate the causation. 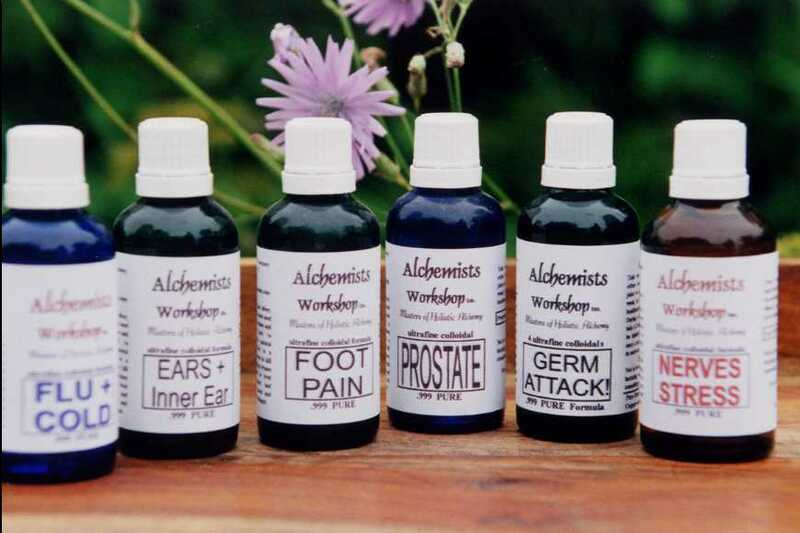 As we are not medical doctors but holistic alchemists practising the tenets and practise's of holistic alchemists throughout the ages, we are not considered qualified to give any medical opinions and thus the opinions we give are our own and should not be considered as medical advice. We make our colloidals to be used as supplements to assist the body in its own natural healing and protection against illness and disease. Although we have personally witnessed, read, and listened to hundreds of anecdotal successfull reports, and studied the successful clinical results once published by leading universities and medical institutions, we are not allowed to advise on the treatment of any illness but direct you to a qualified medical practitioner should you wish to treat any illness. Special Economy Offers are made up as 2 x 100ml. bottles, aprox 8ozs...at reduced prices. BRAIN/Clarity - Special all colloidal formula: (100ml. Double 50ml. Quantity) and larger quantities. FLU+COLDS reglr. 50ml. aprox.2oz - Very Effective in Stopping Flu early on. FLU/COLD 100ml. (double quantity of 50ml.) Use on early symptoms and kill it off fast...! GLANDS/Libido 50ml. - Helps regenerate your glands. A new concept of healing many millenia old and billions of years in the making - The Alchemists Stone A healing stone that energizes the immune system and damaged cells to repair. Super 100% pure organic Colloidal Formulas for the protection, prevention and treatment of COLDS, FLU, COLD SORES, TONSILLITIS, HEAD-COLDS and more.